As an ex A & E nurse, Army nurse and now coach and psychotherapist pain has always been omnipresent in my work. We know it’s a part of life we can’t escape on so many levels. Pain relief is part of medical triage and one of the first line treatments alongside assessing and treating vital signs of life. After the initial injury, medical emergency and the healing phase is over pain can switch off. Unfortunately with chronic pain it is like a smoke alarm that never turns off and in some cases is present 24/7. Can you imagine having to listen to a smoke alarm 24/7 that it’s message was constantly yelling at you “hello I’m pain and still here”! Sadly, this is how a growing number of the population are having to live – in chronic and life sapping pain. Modern day chronic pain is like the plagues of history. For the vast majority of people today’s scientific medicine is failing to cure this epidemic. Pain, and the suffering it leads to, is one of the most debilitating things that can happen to Humans. Let’s explore how pain is created biologically and its purpose to include the relationship between brain, body and function. In a nutshell, the role and function of pain is protection against threat. Our modern day views of health and wellbeing and the reductionist model of medicine are a result of the dualistic theories of the 17th Century philosopher and mathematician Rene Descartes. From this time forward it was believes that there was a division between brain/mind and body and this remains the case in most modern health provision. However, we only have one nervous system and on this basis it’s incorrect to say they are not connected . It is indeed just one nervous system on a bio feedback loop cons/tantly attempting to maintain homeostatis (balance) – I like to think of it as trying to balance an old fashioned children’s seesaw. The brain, as it is part of the feedback loop, has input into all the systems and can create physiological changes. The nervous system in itself is like a community living in a city with fast superhighways managing balance and order for everyone’s wellbeing. It’s been made up of a highly responsive and intelligent committee but a excitable one constantly looking out for danger. It’s called the nervous system because it’s evolved to be nervous. This can make it over reactive and get stuck in patterns of responding to threat even when it has subsided. It likes to keep you reminded because it’s better to be safe than sorry and think the worst so we remember threats! Without this degree of sensitivity we wouldn’t be able to stay alive. We know this to be true when parts start to fail, stop working or the messages are miscommunicated. The brain has a significant controlling function. I like to think of mind as the intelligence and memory which are stored in the whole system. Part of the function (even this term implies a mechanical nature and it cannot be simply reduced to this) of the nervous system is to communicate tissue injury/ damage. This superhighway has specific networks and receptors allocated to dealing with touch, inflammation and damage. The nociceptors are specific receptors to be found at the end of a nerve fibre and their job is to detect threat or in this case damaged tissue (nocer in latin is to injure or hurt). The nociceptors are just receptors communicating their findings up the spinal cord and to the brain for interpretation. Nocicpetors are excitable and frequently can stay “turned on “ long after the injury has healed, as in chronic pain syndromes and phantom limb pain. All pain killers do is try to mask the signals but if the messages remain active the signals just get louder that they can be heard! That’s why over time many patients end up taking higher doses of pain killers in an attempt to dampen the signals. The role of the brain (particularly the parietal and frontal lobes) in pain is to determine the threat level . The brain will search the neural pathways and seek what it knows about the threat and any previous experiences. It does so by looking for things called Neuro tags which are like a graffiti artist’s signature (see work of Professor Lorimer Moseley). Previous experiences and injuries create specific Neuro tags these are key as to whether the brain needs to escalate; dampen down or turn off the response to the threat based on what it knows. So the brain reacts and depends on the perceived level and not the actual stimulation level. 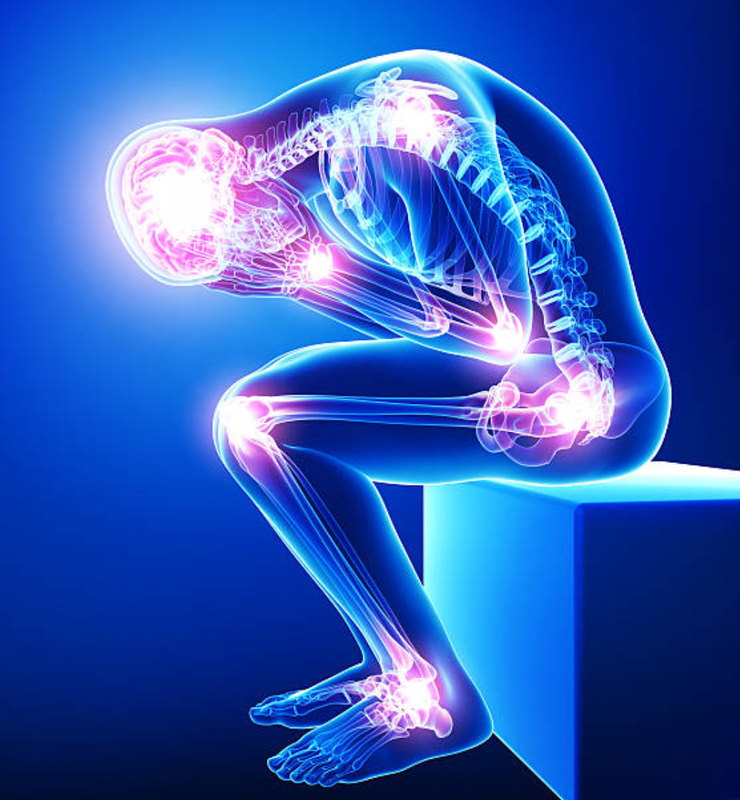 Over the last 20 years many researchers (Bayer et al) have gathered data and there is now a significant body of research which evidences that pain is a measure of how the brain perceives the injury and if it is a threat. In short we need to change our views on how we treat pain. What Are the Contributions To Threat? The NHS services offered to support people in chronic pain is varied. It is a “post code lottery” at best many they are just offered medication. If you are lucky and under the care of more forward thinking specialists you may be offered a wide range of therapies and support services which can be highly effective. Never give up your quest to be pain free the possibilities may surprise you. A client I have been fortunate to assist in becoming pain free had experienced chronic pain with arthritic changes and disc issues in her back. Her GP had advised that she return for stronger painkillers when needed (she was already prescribed the opiate Tramadol). I am pleased to report that she remains pain free. We only required 2 sessions together and a telephone follow up. If any of this blog resonates with you and you are open to possibilities and you’d like some assistance or guidance please get in touch.